Minimally invasive back surgery does not specifically describe one type of surgery. In fact, this surgery can be performed in any part of the spine by making small incisions instead of deep and bigger incisions that are an inevitable part of a traditional spinal surgery. The goal of minimally invasive spinal surgery is to achieve the same results as with traditional surgery without causing any major injuries or cuts to the spine. 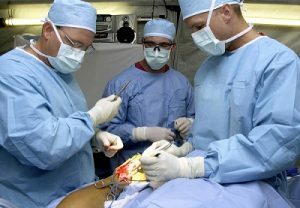 Spine surgeries like discectomy and fusion are often done using minimally invasive techniques; however this type of surgery cannot always be used on all patients. For a minimally invasive spinal procedure the patient is required to stay for only 1-3 days in the hospital and the patient is usually assisted out of the bed shortly after the surgery. Before the patient is discharged from the hospital he is usually given all the needed instructions as well as medication prescriptions. In most cases the patient is allowed to take a ride in a car or even plane once he leaves the hospital. Recovering from minimally invasive spinal surgery is a different experience for different patients and it usually depends upon factors like the health and age of the patient as well as the surgery the patient has undergone. Also, the time period after which the patient can return to work also varies with every patient given the health as well as the type of work the patient do.